Proven Thoroughbreds :: ​RECKLESS CHOICE trots in! 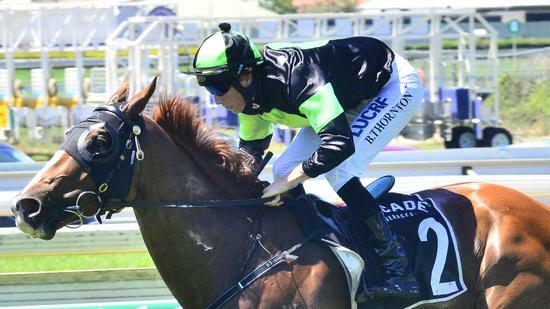 After a frustrating month for Proven Thoroughbreds a welcome fillip came in the shape of RECKLESS CHOICE at Doomben on Saturday. The black and lime green colours had endured a run of 11 2nds before RECKLESS CHOICE broke the drought with an effortless win in the 1600m Class 3. Ridden by Boris Thornton, the son of CHOISIR sliced through from a midfield position before racing away to win eased down by 2.5 lengths. All three of Proven Thoroughbreds’ winners for the new year hail from the Steve O’Dea stable. Steve has shown remarkable patience with this horse and the owners are starting to reap the rewards. The four-year-old was a maiden until his ninth start but now boasts a record that reads four wins and eight placings from 15 starts. This year Proven Thoroughbreds is syndicating another son of CHOISIR closely related to RECKLESS CHOICE, to be trained by Steve – the CHOISIR x SHAMANA colt. To enquire about the CHOISIR x SHAMANA colt visit our CONTACT US page.